to schedule a private audition for Company 2019-2020! 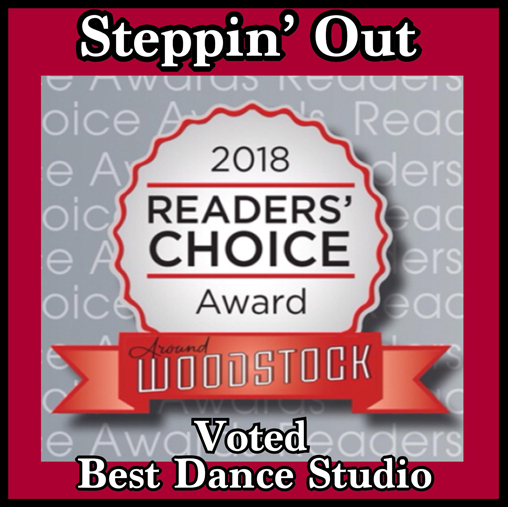 Steppin' Out Performing Arts Center provides quality dance classes in a positive and fun environment for ages 2 1/2 - adult. Our curriculum of dance includes pre-dance, ballet, tap, jazz, hip hop, lyrical, contemporary, musical theatre, pointe and gymnastics for beginners through advanced students and adults. Our facility offers 4 dance studios with raised floors over 8000 square feet. We have a lobby space for your comfort, snack area for students, viewing televisions, locker room, kids play area and study area for our students. The directors of the studio, Autumn Ritter and Heather Knight, are acclaimed teachers and choreographers who have mastered their craft in enhancing the lives of the students and families whose lives are touched by the arts. Steppin' Out also offers a professional environment for the more serious dancer to receive top notch training. Our recognition brings in many talented full time teachers, professional dancers and guest teachers to enhance the lives of our companies who compete in the Atlanta area and the southeast. Whether you are interested in the arts for a fun activity, or to achieve the necessary skills to go on to a professional career, our energetic and enthusiastic staff will help you to succeed. Steppin' Out provides a diverse setting for everyone. Please be sure you browse through our website to obtain more information on our staff, classes, tuition, and SOPAC company. You can also become a fan and follow us on Facebook, Twitter and Instagram at Steppin Out PAC, Come check us out! *Tuition – Our season runs from early August – May. The tuition rate is for the entire season (9 ½ months). Tuition is not based on the number of classes per month, but the entire duration of our season. Tuition is due the 1st of the month. Please make sure your tuition is paid on time to prevent a $10.00 late fee. For the months of January (Winter Break), and April (Spring break); you need to make a payment by the 1st to avoid a late fee. We require a 30 day email notice if you wish to withdraw from a class.